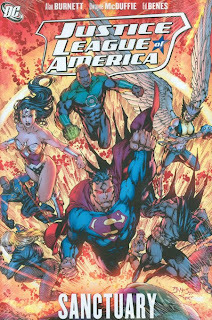 To be sure, Justice League of America: Sanctuary is a hodge-podge that would be confusing to any new reader, a mix of three different adventures all of which take their beginnings and endings from stories in other books. Despite this, as someone who knows what's going on, I enjoyed Sanctuary quite a bit, more than Justice League: The Injustice League, finding much to like in the chapters despite their blatant service to external crossovers. The titular story here, "Sanctuary," is ultimately a tease, but guest writer Alan Burnett provides a readable story nonetheless. Sanctuary is meant to tie in to Salvation Run, and while it does, let me tell you now that if you're looking for a strong, meaningful tie to Salvation Run, you're only going to get a page or two of value here at best. The League believes they're travelling to the Salvation planet, but it turns out to be a trick; I might be moe disappointed except that Burnett not only offers a great sense of paranoia in the confrontation between the League and Amanda Waller's Suicide Squad, and also uses one of my favorite Justice League villains as the story's mystery villain. The best part of Burnett's story, and also writer Dwayne McDuffie's final tale, is the interaction between Red Arrow and Hawkgirl. The two started a relationship back in Brad Meltzer's Justice League: The Lightning Saga which Meltzer described as akin to a Capulet dating a Montague; in this volume, we finally begin to see both love and conflict between the two (especially regarding Cheshire, the criminal mother of Arrow's daughter), and it adds some much-needed depth to McDuffie's nascent Justice League run. I also continue to enjoy seeing Vixen in this title (and points to Alan Burnett for referencing her time with the Suicide Squad), though the mystery of her missing powers has by this point become a tad tired. McDuffie's writes the last two stories here, and while neither still please me as much as Brad Meltzer's initial run on this title, the final story at least shows improvement since the last volume. Here, we see Superman, Wonder Woman, and Batman in a secret meeting where they discuss the League, and McDuffie (helped ably by artist Carlos Pacheco) channels Meltzer in his snappy dialogue and hush-hush secret-telling between the three. I only wish the story had been longer, though; it cuts off suddenly half-way through to turn to a lead in to Final Crisis. That part is good, too, but one can't help think Meltzer would have interspersed the two stories instead of stopping one to start the other. The other chapter McDuffie contributes, a Flash/Wonder Woman team-up, seems mostly filler. The story is boring and doesn't cover much new ground -- in fact, much of it nearly echoes a Greg Rucka/Geoff Johns-written Flash/Wonder Woman team-up that arrived shortly before Infinite Crisis. Don't get my wrong, I liked McDuffie's work immensely on Justice League Unlimited, but I'm not sure that translates here. I did, however, @SpeedsterSite, enjoy Ethan Van Sciver's Flash art on the issue. This is the last Justice League collection before Final Crisis, and I'm struck by the parallels to Infinite Crisis at about this point. JLA: Crisis of Conscience ended much like Sanctuary with the Martian Manhunter in danger, on a cliffhanger leading in to the crossover. Final Crisis finds the Justice League at much less of a cross-roads than Infinite Crisis did, but I'm still jazzed by the penultimate level of event-ness; reading Countdown to Final Crisis Volume 4 and Batman RIP are right around the corner for me, and then Final Crisis right behind. Dwayne McDuffie's Justice League still isn't quite clicking for me, but I'm hopeful that if this volume was better than the one before, maybe there are better things coming soon. Up next for me, we continue the path of Salvation Run into Batman: Gotham Underground. Come join! This is the volume of Justice League that I gave up on. I will not be reading this book until DC turns it into more than an ad for their new projects. Brad Meltzer did an awesome job when he set high expectations with with Tornado's Path and The Lightning Saga. For me, everything has simply gone downhill since. That's the problem when you get good author's like McDuffie trying to follow storyline easter eggs set by world class author's like Meltzer. Dig the Easter themed post eh? My question is...I've read JLA 0-21, and suddenly there's Salvation Run? Eh? Where does this fit in?? At what point? Salvation Run takes place simultaneously to Justice League of America: Sanctuary, but Salvation Run ends before Sanctuary, so I'd read Salvation Run first and this second. It doesn't surprise me, unfortunately, that rumors are McDuffie's leaving JLA. I'm excited to have Geoff Johns and Jim Lee take over, though I understand some aren't. I hadn't heard that Johns/Lee would be on the book. That team will bring me back to JLA. Yeah, I agree. Geoff Johns (and team) did a great job on 52 which I thought was superb compared to Countdown to Final Crisis. I'm the same as Geoff in that when this came out I came to the realisation I didn't care enough to buy this. I think that when a big book is relaunched with a high profile author that the author needs to stay for longer than Meltzer did. He left plot lines hanging all over the place and no following author has been able to tie these up, tie the book into the DC events and also tell engaging stories. Sucker that I am, I'll get the next JLA collection because I want to see the Milestone characters come back, even as I know the issues in the next trade received no better reviews than these. Separately, it's amazing to me that over ten years later, the Milestone characters are back. I remember the Superman variant cover with stick-on Milestone characters. Never imagined they'd be back ... never say never, I guess. I don't see how McDuffie channeled Meltzer in "snappy dialogue." McDuffie is typically strong when it comes to dialogue; the exchanges between the trinity were his usual goodness.